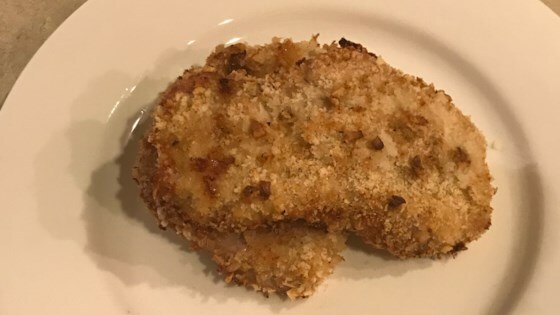 "Juicy, breaded, baked pork chops." In large freezer bag, combine beer, Worcestershire sauce, garlic, Old Bay Seasoning(TM), salt, pepper, and pork chops. Marinate for 30 minutes. Preheat the oven to 325 degrees F (165 degrees C). On a large plate, mix panko crumbs and Parmesan cheese. In a shallow bowl, whisk eggs until creamy. Remove pork chops from marinade. Dip each chop in egg, then press into crumb mixture to coat. Transfer chops to non-stick baking pan. Bake in preheated oven for 25 minutes on one side. Turn chops over and continue cooking for another 25 minutes. Raise temperature to 350 degrees F (175 degrees C), and continue cooking until pork chops achieve an internal temperature of 145 degrees F (63 degrees C) and the coating is crispy. I think either the temperature or the cooking time was a bit off on this one as the pork chops were a bit dry.